Sun lounges with an spectacular view to the beatiful sunsets. All our master suite are different. 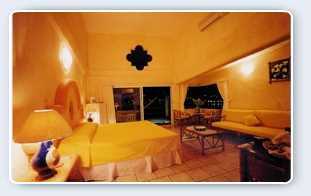 This is located next to the pool and garden has one king size bed and one sofa bed. This unit can be in doors connected with two more standard rooms. This is perfect for parties for it`s location on the sun level. It`s the most romantic for it`s spectacular view and the under star jaccuzi. This unit only has king size bed.